Maple Gold Mines Ltd. is pleased to provide an update on the current drill campaign at the Douay Gold Project. February 27, 2018 – Montreal (Quebec): Maple Gold Mines Ltd. (“Maple Gold” or the “Company”) (TSX-V: MGM, OTCQB: MGMLF; Frankfurt: M3G - https://www.youtube.com/watch?v=QHmDlWCznkI&t=1s) is pleased to provide an update on the current drill campaign at the Douay Gold Project (“Douay”). Maple Gold has now received three (3) of the four (4) requested permits and anticipates receiving its final permit very shortly. Two diamond core drills (“DDH”) are now testing infill and step-out holes and a third drill rig has arrived to site to begin testing extension targets in the Porphyry to NW Zone gap (see Figure 1). The Company has initiated property-wide drill site preparation for the recently permitted sites and an additional two DDH rigs will be mobilized to the project as soon as initial sites are ready. One of the new permits covers greenfields syenite and VMS targets that start ~4 km NW of the Resource Area and continue for 5 km along the northern strand of the Casa Berardi Deformation Zone (see Figure 1). A final DDH permit is pending that covers additional drill sites within the Resource Area, as well as the compelling 6 km by 1 km NE Syenite Target (see press releases November 29, 2017 and January 10, 2018). The NE Syenite Target intrusion is not present on government maps and was identified by evaluating results from the limited amount of historical top-of-bedrock RC drilling that was previously completed at Douay in the 1980’s. 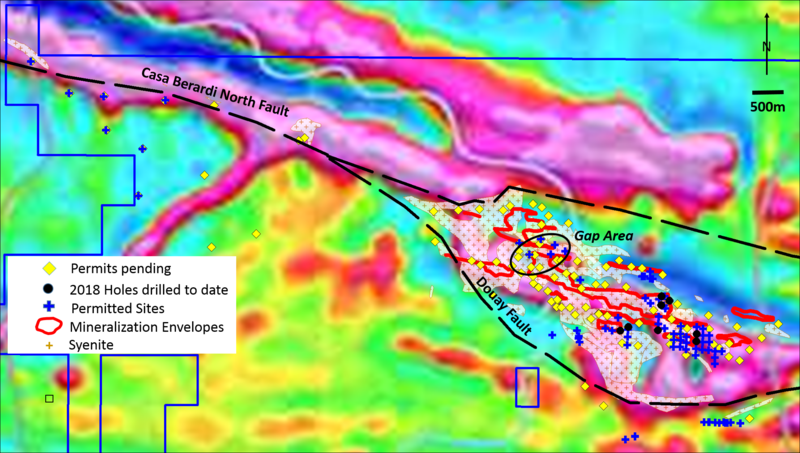 Maple Gold geologists believe this approach will help the Company generate numerous new target areas within the 55 km of strike along the Casa Berardi Deformation Zone. All permits for the Company’s planned RC top-of-bedrock drilling have now been received. Site preparation is already underway and the 3,000+ metres of RC drilling is expected to commence within approximately 10 days. The scientific and technical data contained in this press release was reviewed and prepared under the supervision of Fred Speidel, M. Sc., P. Geo., Vice-President Exploration of Maple Gold. Mr. Speidel is a Qualified Person under National Instrument 43-101 Standards of Disclosure for Mineral Projects. Mr. Speidel has verified the data related to the exploration information disclosed in this news release through his direct participation in the work. Maple Gold is a well-funded gold exploration company focused on advancing a district-scale gold project in one of the world’s premier mining jurisdictions. The Company’s 370 km² Douay Gold Project is located along the Casa Berardi Deformation Zone within the prolific Abitibi Greenstone Belt in northern Quebec, Canada. The Project has an established gold resource that remains open in multiple directions, with excellent infrastructure and several large scale operating mines within this prolific mining district. Maple Gold has a significant drill campaign under way to expand on the known Resource Areas and test new discovery targets within the Company’s 55 km of strike along the Casa Berardi Deformation Zone. For more information, please visit www.maplegoldmines.com.